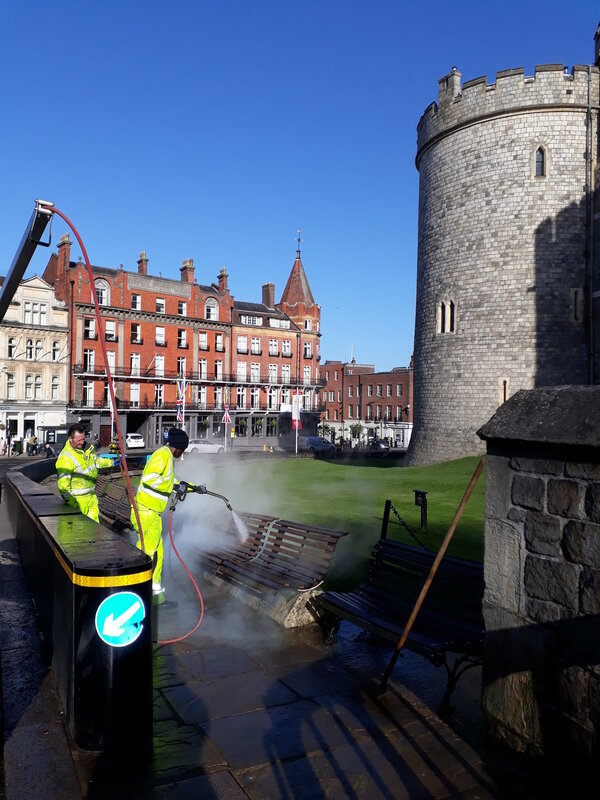 The Royal Borough of Windsor & Maidenhead Council has expressed its gratitude to the workers whose efforts made sure Windsor was in pristine condition for the recent royal weddings. Urbaser Ltd, the environmental services provider responsible for helping to deliver the Borough’s annual street cleansing programme, worked in conjunction with VolkerHighways, the Council’s Highways management and maintenance contractor, to make Windsor sparkle for the two big days in May and October 2018. The recent Royal ceremony between Princess Eugenie of York and Jack Brooksbank saw Urbaser employees hot wash the town centre in the week preceding the wedding, and fully cleanse the town and procession route between 1am and 4am on the day of the ceremony before the areas were cordoned off. Following the ceremony Urbaser performed a full return to standard deep cleanse, ensuring the town was ready for normal Saturday tourism and commerce. These efforts follow Urbaser’s high-profile operations in May for the Royal Wedding of Prince Harry, Duke of Sussex, and Meghan Markle, Duchess of Sussex, which saw over 110,000 visitors arrive in the town and was watched by over two billion people worldwide. In total, 12 cleansing vehicles were used during the operation, consisting of road sweepers, street washers and caged tippers, with employees working day and night to maintain the highest standards of street cleanliness. In total, around 40 tonnes of waste and recycling were collected over the three days. Cllr Bicknell, Cabinet Member for Highways, Transport and Windsor, said: “Hosting the royal wedding of the Duke and Duchess of Sussex was a huge responsibility for the Royal Borough and we are exceptionally proud of how amazing Windsor looked during the celebrations and how quickly the town returned to normal after over 110,000 people came to join in the celebrations. Javier Peiro, Managing Director, Urbaser Ltd, said: “The efforts by our employees to ensure that Windsor looked immaculately clean for a global audience to such a high-profile event demonstrates Urbaser’s commitment to local communities we serve. I am truly proud of the work performed by our employees and the overwhelming feedback we have received on our services”.